Irresistibly tempting, burgers may sometimes be perceived as the all too common fast-food-takeaway meal, with its simple principle: a cut bun with meat and some more ingredients inside. Yet a great burger is more than the sum of its parts and it can easily transform into a gourmet treat. Burgers lend themselves to an endless variety of combination of ingredients, be they vegetables, cheese, dressing or meat. 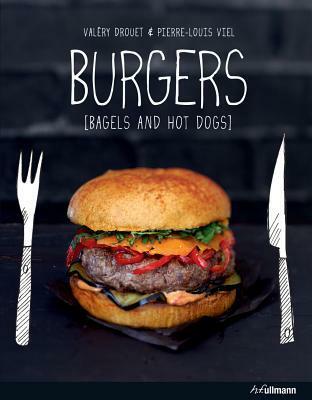 This book offers more than 50 recipes for burgers, bagels and hot dogs – from the classic Cheeseburger to the deliciously spicy Thai burger with shrimps, the bagel with oil-marinated sardines and some sweet treats. French chef Valéry Drouet is a regular contributor to the food pages of women’s magazines, the author of numerous cooking books, and a food stylist for the advertising industry. This was a great cookbook for burgers. There were some awesome burger recipes that I can see myself trying when summer comes around again! Would recommend if you want to spice up your burgers!